We’re gettin’ ready for the holidays here in the Make Shoppe. My latest project has been designing some dazzling and attractive “Holiday Bling!” The particular bracelet featured is made up of high-end Swarovski crystals and gold filled rondells (which are the blingy spacers between the crystals). These super easy glide on style bracelets are the perfect gift and definitely take the guess-work out of deciding what size to buy. If you or anyone you know is interested in knowing more about these please don’t hesitate to contact me through my Etsy Shop. Also, custom sizes and color combos are available! I encourage you visit Chris’s site filled with all other types of animated artistic developments! Tinker is a baby Panda and Sasha is a baby Fox. Together they will appear on cards, stationary or wherever their cute little faces can go! You can also find these animal babes on Etsy! Hey there Make Shoppers! As you all know, Father’s Day is this Sunday June 17th. Do you have a card ready for Dad? Well no worries because I’ll be sharing my Father’s Day card ideas with you! As you can see in the featured picture all you need is some colored card stock and some basic punches to get things started. Try using your imagination to create certain shapes. For example, for the body of my frog I used a round circle, a heart shape punch for the legs and a maple leaf punch for the frog feet. 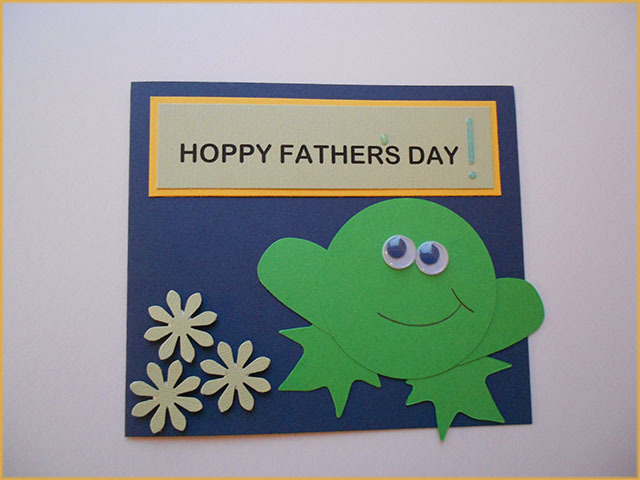 Also, don’t worry about being too perfect…your card should have a handcrafted feel to it that Dad will love! Now that summer is almost here, Tutu really loves spending time outdoors but what do you really want for lunch or dinner when it’s really hot? Can’t imagine cooking a meal that creates too much heat in the Bake Shoppe. So, today we’re stayin’ cool with Cucumbers. This is an easy recipe followed from Simply Recipes, Cucumber Salad. Rinse and peel cucumbers. Cut lengthwise then slice crosswise. Combine all your ingredients in a large bowl and toss to coat and sprinkle with sesame seeds. Serve immediately, or make ahead (up to a couple of hours) and chill. Try this really easy technique of making zucchini curls! You’ll need a few zucchini, sliced tomatoes and a vegetable peeler. Start by peeling a small amount from the center of the zucchini just to expose the inside a bit. Next, peel a strip from the zucchini starting from just above the exposed middle and peeling all the way to the end. The peels will have a natural curl to them-just roll them up and place them in your serving dish to create the rolled ribbon effect! Finally add your tomatoes and dressing if desired. You can also try this with yellow squash.